By August 2008 (a decade ago), my independent consulting practice was less than two years old. And the economic downturn was in the air. Perhaps the worry related to questions like, “What would happen to my business? Will I have to shut the shop?” was visible on my face. It was pointed out by my wife and friends. This is when I reflected upon the signals that might indicate that my passion has turned into an obsession. Obsession and anxiety are two sides of the same coin. Hence, I thought of making a checklist that might help me observe my own anxiety. I wrote the article “Thin line between passion and obsession” (Aug 24, 2008) in which I published an obsession checklist. I thought a decade is a good time to revisit the checklist and look at its usefulness. If I answer the checklist today, what do I see? 3. Did I listen to Hindustani classical music in the past 2 weeks? (Yes, listened to my flute teacher play raga Durga last Saturday after my class). 5. Did I go cycling with my son in the last 2-3 weeks? (Yes, our son doesn’t live with us anymore. But I went cycling last week alone. We visited our son in Pune last week and went for a walk with him on lush green Panchwati hills). 6. Did I get out of the city in the last 2-3 months? 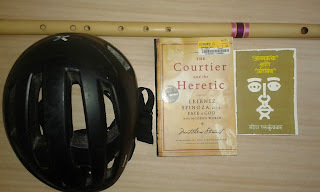 (Yes, returned from a visit to Mumbai-Pune a few days back and visited Coimbatore 2 weeks ago). 7. Did I read any fiction, especially a Marathi book in the past 2-3 months? (Yes, read the play Atmakatha (Autobiography) by Mahesh Elkunchwar a few days ago). So, looks like I am doing ok as far as the checklist is concerned. Question is: is the checklist still relevant today? To answer this question, let’s first ask, “What does this checklist represent?” If I understand correctly, this checklist represents little joys as I saw them a decade ago. It so happens that all these activities continue to give me joy even today. But the list of little joys has grown significantly in the last decade. What does it contain now? Well, a number of small things seem to give joy – cutting vegetables, making tea, watering plants, making home compost, juggling, playing cricket in the corridor with a 5-year-old neighbor etc. But perhaps the most significant addition to the list is – doing nothing. I could be sitting in my house or in a bus or at an airport or in a reception area and just watching the movements – sounds, thoughts, people, breath etc. and just enjoy being there. What about the original anxiety of not getting any customer and not making any money? Well, in the last twelve years, there were some years in which I made less money. And? Nothing happened. In fact, I don’t remember anything special of those years. I am sure, all the basic needs – food, shelter, clothing even travel weren’t affected. And that’s where the main point may be. That is, over the years, my needs have shrunk significantly. There is no goal to be achieved. Journey seems to be primary and destination secondary. In short, the obsession checklist isn’t obsolete. However, there is no dearth of small joys every day. Is “design thinking” old wine in a new bottle?